I’m abhorrently against new year resolutions—to lose weight, get fit, eat better, do better, be better. January 1st means the start of a new diet, phase one of a “new you” plan, or a 5 a.m. wake-up call to go to the gym as part of a get-fit resolution that likely won’t last. I’d rather stay in bed a little longer under my warm, thick comforter with three cats snuggled against my legs. I mean, why put so much pressure on ourselves at the beginning of a brand new year? That’s not to say I don’t make new goals. I do often, certainly more than once a year. But never in January (see above). A couple of months ago, I made a long list of things I’d like to accomplish over the next little while. The list included some maintenance goals (continue my exercise plan), personal things (smile more), and also some big things (dreaded home renos). I moved into a new (albeit very old) house back in November and we have a laundry list of things we want to change. Despite the stress that all home renos bring, I’m going to declare 2016 the year of home improvement. It’s going to take a whole lot longer than a year to finish all the projects, but we’ve got to start somewhere. One project at a time. Fortunately, the kitchen is at the top of our list, but I’m terrible at making decisions. Like, what appliances do I want? What customized features will work best in the space? Do I want hardwood or tile floors? A feminine apron sink or industrial stainless steel? Granite or marble or butcher block? Can we afford a Wolf? (Please let there be room in the budget for a Wolf.) Not to mention all the issues that come up once we open up the walls. Once the kitchen is done, another goal I’d like to tackle is to host more dinner parties. I mean, I love entertaining and I’ve done so many times in the past. But dinner parties scare the heck out of me. Once I send out the invite, the pressure is on to create the best vegan dinner to please my omnivore guests. There’s no casual way to go about it. Everything has got to be perfect. I’d really like to work on getting past that fear, and to loosen up. So what if the mushroom gravy is a little lumpy or the homemade pudding didn’t turn out as thick as it was supposed to. So what? Just grab yourself another glass of wine and move on. This brings me to an incredible recipe I found in Tal Ronnen’s relatively new Crossroads cookbook. 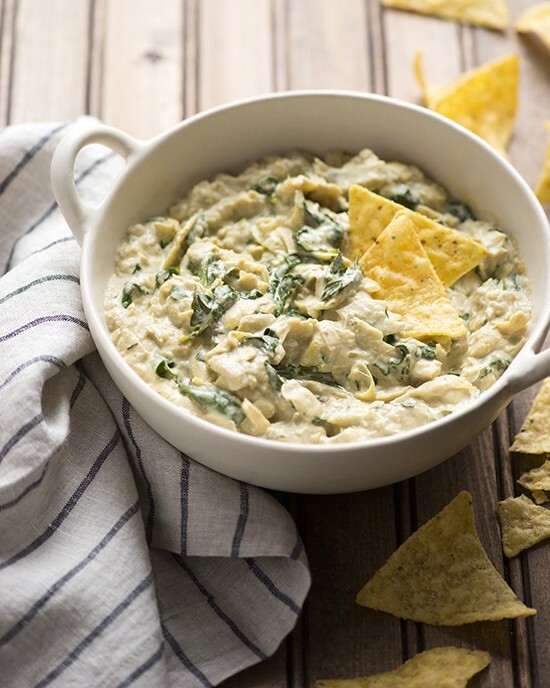 This warm kale and artichoke dip is so good that as soon as I tasted it I immediately declared it a MUST at my next dinner party. And it should be at yours too. His new cookbook shares 100 Mediterranean-inspired recipes, such as lentil skillet bread, hearts of palm calamari with cocktail sauce and lemon-caper aioli, pappardelle bolognese (using handmade pasta), and decadent dark chocolate cake with figs and hazelnuts, that take vegan cooking to a whole new level and are sophisticated enough to serve at just about any dinner party, which make me especially excited about this book. And, while many of the recipes call for wine, sherry or Earth Balance butter to make them rich and flavourful, they also include plenty of healthy ingredients (lentils, chickpeas, greens and veggies galore). I like that there is also a small section on elegant cocktails as well as simple pantry staples, such as almond-based Greek yogurt and walnut parmesan. 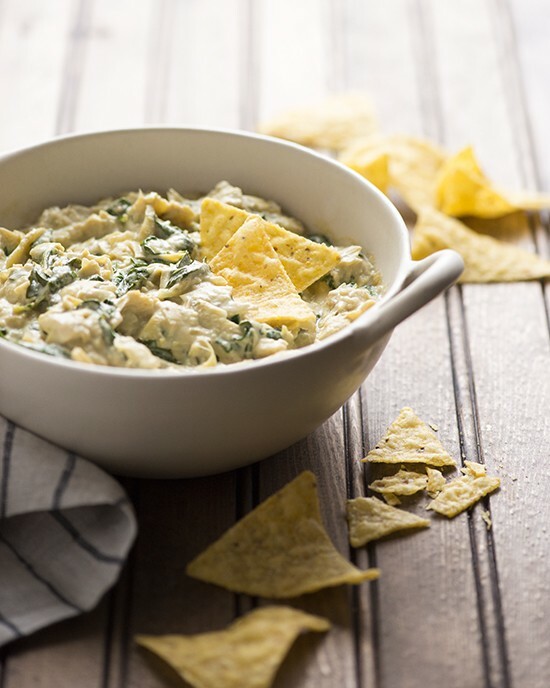 Thanks to the book’s publisher, Artisan Books, I’m able to share the recipe for this incredible dip. 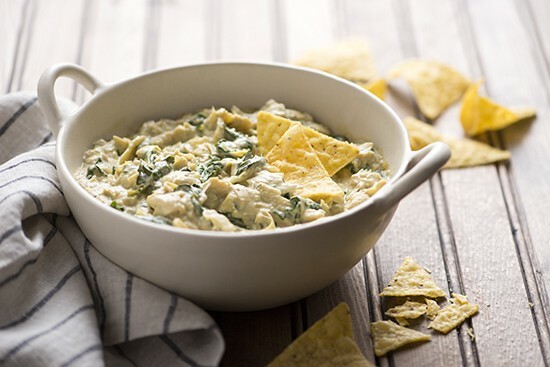 Here, Tal transforms the classic spinach and artichoke dip into a contemporary version that is still rich and creamy but allows the vegetables to shine. Kale’s chewy texture and peppery kick make it a bold stand-in for spinach, which I love. The cashew cream needs to be prepared a day in advance, so plan accordingly. Enjoy! If using fresh artichoke hearts, bring a large pot of lightly salted water to a boil. Add the artichoke hearts and blanch for 10 minutes, or until slightly tender; a paring knife should slide in easily. Drain the hearts and plunge into an ice bath to "shock" them---i.e., stop the cooking and cool them quickly. Drain and coarsely chop. If using canned artichokes, simple drain and chop. Put a large deep sauté pan over medium heat and add the butter substitute. When it has melted, add the shallots, garlic and artichoke hearts and cook, stirring, until the vegetables are soft, 6 to 8 minutes. Add the wine and sherry and cook for 1 minute to evaporate some of the alcohol. Add the cashew cream, stock, nutritional yeast flakes, and thyme, reduce the heat to medium-low, and gently simmer until thick, 35 to 40 minutes; stir occasionally to make sure the cream mixture doesn't stick and burn on the bottom of the pan. If the dip appears too thick, add a couple of tablespoons of stock water. Spoon the dip into the serving bowl, dust with smokes paprika, and serve with the potato chips, crackers, or slice raw vegetables. Put 2 cups cashews in a bowl and pour in enough cold filtered water to cover. Cover with plastic wrap and refrigerate for at least 12 hours, or up to 1 day. Drain the cashews in a colander and rinse with cold water. Transfer the cashews to a blender, preferable a Vitamix, and pour in enough cold filtered water to cover them by 1 inch, about 3 cups. Blend on high for 2 to 3 minutes, until very thick and creamy without any trace of graininess. The cashew cream should be smooth on the palate; add more water if necessary. If you're not using a heavy duty blender, you may need to strain the cashew cream through a fine-mesh sieve to get rid of any grittiness. Cover and refrigerate until ready to use. It will thicken as it sits, so blend with 1/2 cup or so filtered water if needed to reach the desired consistency. It can also be frozen. Excerpted from Crossroads by Tal Ronnen with Scot Jones (Artisan Books). Copyright © 2015. Thank you, Cadry! I’m just getting used to the little space in my new kitchen that provides enough light for photos. It’s not nearly as much space as my old house but it seems to do the trick! 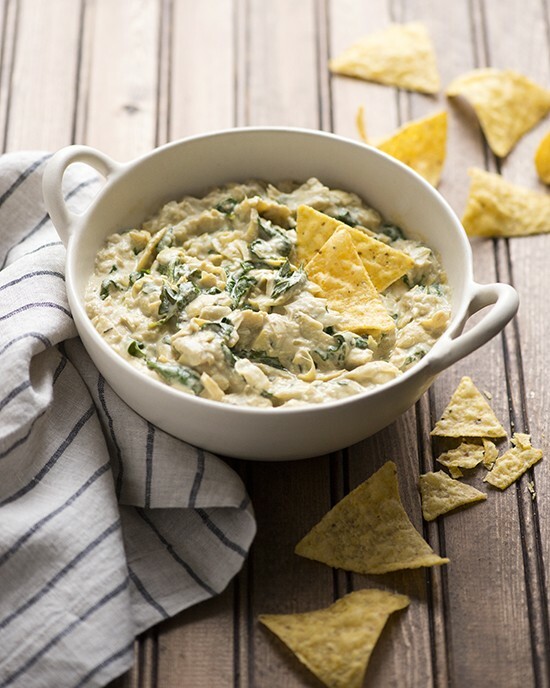 I’d encourage you to try this dip–it’s SO good! I have Tal Ronnen’s first book, but I’ve never actually made anything from it. This dip sounds and looks delicious. 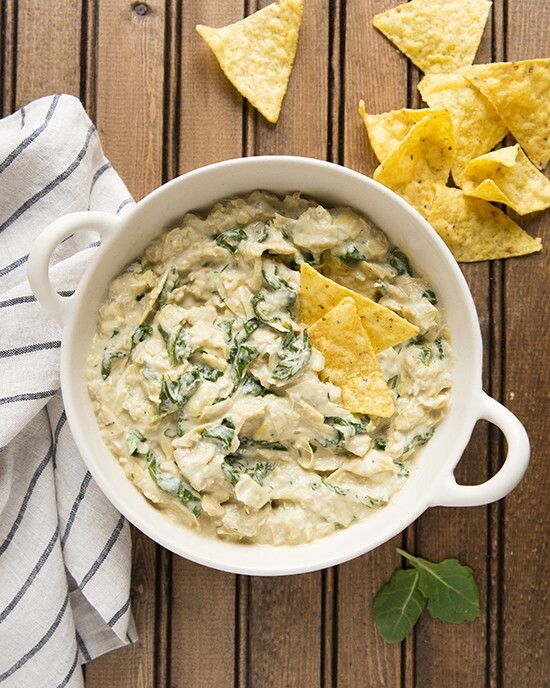 I never make artichoke dip! Thanks for sharing the recipe, I think my husband would love it. I’m actually a fan of New Year’s Resolutions – just in the last couple of years I’ve gotten really into Wintertime in general. I think it was for a couple of reasons – partly when my dad was super sick and in the hospital for months, and at the same time we were having this years-long drought… and I just kept thinking “I just want a rainy day to sit inside and rest and recharge.” Somehow that experience got me connected to how important the dark and quiet reflective mood of winter is for me. This year I made 3 really practical resolutions and also I gave myself two “theme words” for the year. So far I am really enjoying the guidance I’ve created for myself! Good luck with your remodel… a fun and grueling project all at once — but think of the rewards down the road when your environment is personalized to your desires!! Thanks, Amey! I’m glad to hear you’ve started making practical (and hopefully doable!) resolutions, and I love the idea of theme word for the year! The addition of the kale was superb. I hope you get a chance to try it! It looks so delicious!!!! thanks for putting this up and GREAT pictures!